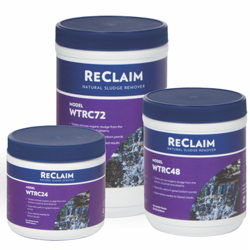 ReClaim tablets quickly go to work removing the build-up of dead algae, decomposing leaves, and fish waste that accumulate as sludge on the bottom of ponds and streams. Used regularly, ReClaim tablets will reduce the frequency of pond cleanouts and overall pond maintenance. Application Rate: Apply 2 tablets for every 100 sq ft every 2 weeks. For ponds with heavy sludge buildup apply ReClaim at the prescribed rate once a week until desired results are achieved. For Best Results: Apply ReClaim tablets at the prescribed rate directly to sludge buildup. Use supplemental aeration to enhance biological activity. Optimal Water Condition: pH: 6.5-8.5, Temperature: 50F or above.